This book argues against the assumption that sustainability and environmental conservation are naturally the common goal and norm for everyone in Amazonia. This is the first book focusing on agency, reflexivity and social development to address sustainable development in the region. It discusses the importance of looking into societal dynamics in order to deal with deforestation and sustainable development policies through the ethnography of an Amazonian settlement named New Paradise. This book demystifies utopian and overtly conservationist views that depict the Amazon rainforest as a troubled paradise. 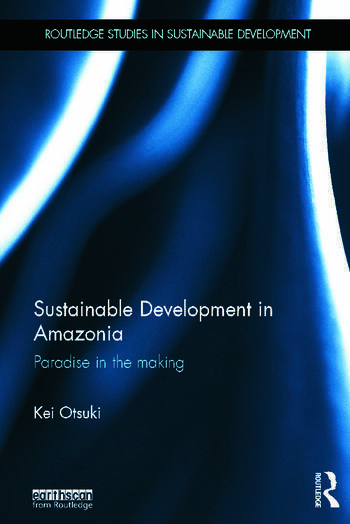 Engaging with social theory of practice with particular focus on emergentist perspectives and Foucault’s analysis of ‘heterotopia’, the author shows that Amazonia is a set of settlement heterotopias in which various local and external initiatives interact to make up real, lived-in places. The settlers’ placemaking continually rearranges power and material relations while the process usually emphasises utopian developmentalist and conservationist policy intervention. This book explores in detail how, as power relations are arranged and governance reshaped, sustainable development and construction of a green society also need to become a goal for the settlers themselves. The book’s insights on the relationship between the sustainable development frameworks used in environmental policy, and ongoing societal development on the ground inform debate both within Amazonia, and in comparable communities worldwide. It also offers institutional pathways to realise new, more engaging, policy intervention for development professionals and policy makers. Kei Otsuki is currently a Research Associate at United Nations University Institute for Sustainability and Peace and holds a PhD in Social Sciences from Wageningen University. She has published on sustainable development in international journals such as Environment and Planning, Human Organization, Natural Resources Forum, and Local Environment.